Many photographers are looking to this camera, and the X-series in general, as a system that could serve as a compact, less expensive substitute for larger, more cumbersome DSLR cameras -- if not all the time, at least occasionally, as when travelling. I fall into this category. I would like to have an alternate, lighter and more compact camera system to use for spontaneous shooting, travel, or personal work where I just don't want to lug a full DSLR outfit with me. I conducted this series of tests with those requisites in mind. The X-T1 is a stylistic departure from the typical X-camera genre. It drops the retro range-finder style for a new retro DSLR look to accommodate a completely re-designed electronic viewfinder, replaces many of the previously digital functions with analog dials, adds weather-proofing to the body (and ultimately the system with upcoming professional lenses), while keeping the sensor and processing improvements already introduced in the X-E2. The first thing everyone mentions about the X-T1 is its ground-breaking viewfinder, and I have to say it definitely lives up to the hype. It presents a very large image that even pro-DSLR users will appreciate. 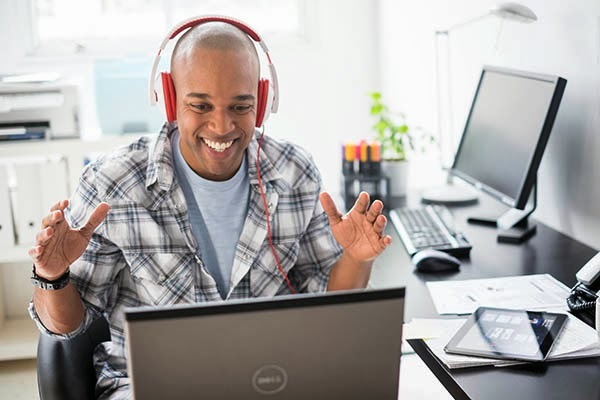 On top of that, it is bright and has the advantage of approximating how the final image will look so you can tweak exposure adjustments without removing your eye from the viewfinder. 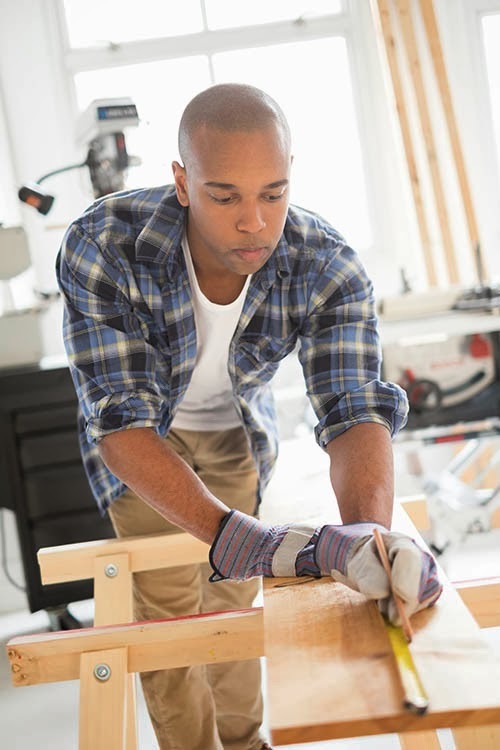 Eyeglass wearers will welcome the fact they can see the whole image outline with their glasses on. Last, but definitely not least, the refresh rate has been improved to a point where it appears to be almost instantaneous even when the camera is operating at its fast 8fps continuous rate. I have never been a fan of EVF, but this one is changing my mind. Many of the digital menu items have been moved to analog dials. It didn't take me long to adjust to this new configuration, but then again I began photography in the analog era. I prefer the controls this way. They are immediately available, and can be used without taking your eye from the viewfinder once you become acclimated to them -- and no groping through menus while the scene in front of you is changing. The top dial on the left controls ISO, while the bottom Drive dial selects continuous shooting mode, bracketing, double exposure, advanced filter effects, and panorama. The shutter speed dial sits just to the right of the viewfinder and adjusts shutter speed as it didon prior models, while the bottom selector chooses the metering mode. On the far right is an improved exposure control dial. 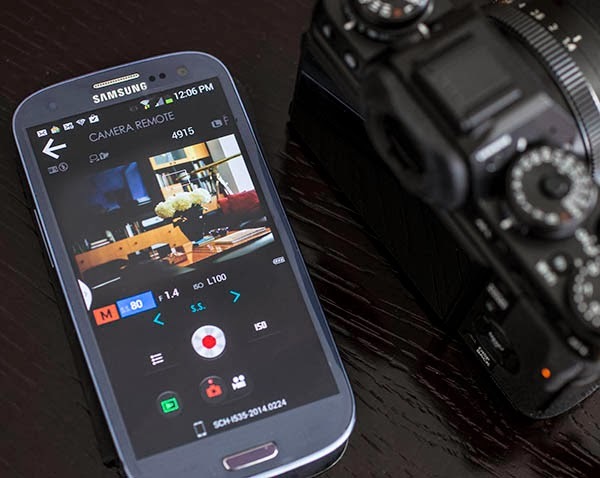 The Wi-Fi button connects the camera directly to the smart phone Fuji Remote control APP with one push when the camera is in playback mode -- a very convenient feature. 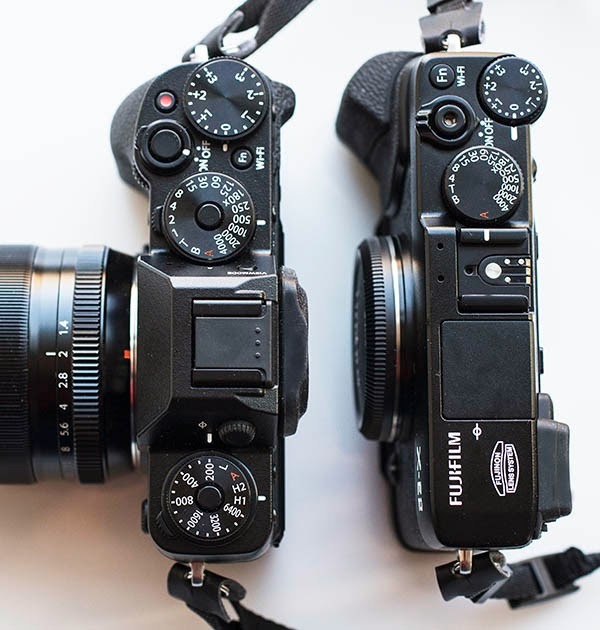 In photographs the X-T1 looks deceptively larger than it really is. 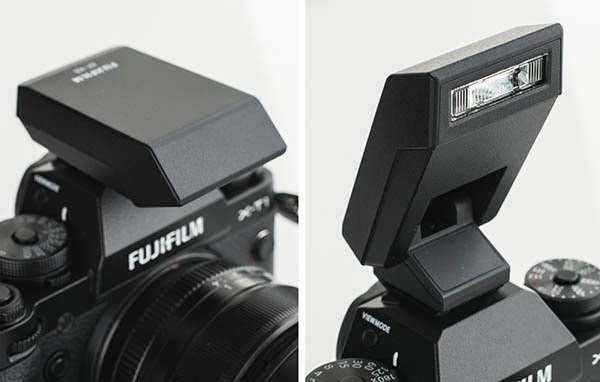 In fact it has almost the same footprint as the X-E2 shown above on the right. 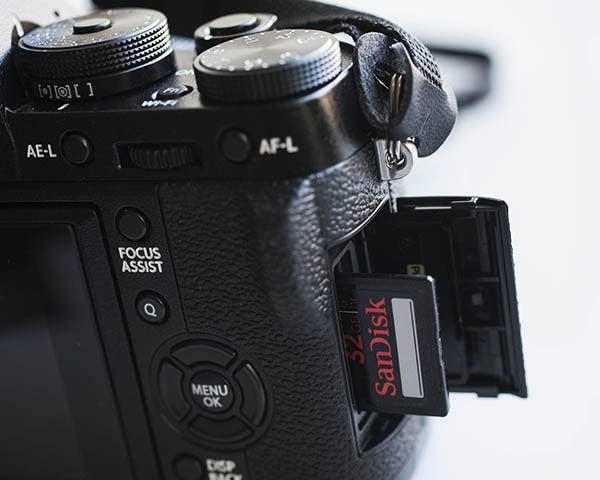 The X-T1 takes a single SD card in a newly designed side slot, and can already take advantage of the latest extra fast USH-II SD cards. Something that should improve its speedy performance even more. Fuji built this camera realizing its potential value to professional photographers. The magnesium alloy body is now weather sealed. Unfortunately, this does away with the retro-style screw-in cable release and replaces it with a USB plug-in type. Auto-focus, and particularly continuous auto-focus has been improved even further to a very fast and accurate level. An optional battery grip not only extends the shooting life but provides a firmer grip for holding the camera vertically. Fuji claims 350 shots from a fully charged single battery, but I received far more than that in my tests. Like all prior X models the battery goes from showing a partial view to completely dead with little warning. Would have been nice if it had a percentage-of-use scale. The camera is very quiet, a feature that candid photographers and wedding photographers might appreciate. Focus assist for manual focusing lenses has been given its own dedicated button conveniently located under the rear dial command dial. A flash sync terminal has been added to the front of the camera. It has full HD movie recording (1080/60p-30p, 36Mbps bitrate) along with built-in stereo microphone. The SD card slot has moved from the base in the battery chamber to the side of the camera. The X-T1 also adds the ability to use the newer, and faster UHS-II cards, improving its processing speed performance even further. The X-T1 does not have a built-in flash, but does come with an accessory flash that slips into the hot shoe. One advantage to this flash is that it lifts high enough when open not to cast a shadow from the from camera lens shade. Of course the disadvantage is that you will have to remember to carry it with you. The flash itself is tiny because it draws its battery power from the camera. A second command dial has been added to the front. One of its features is to alter the in-between shutter speed setting in one third stop increments when using shutter speeds in manual mode. The most difficult situation for continuous focus tracking is when a subject is moving towards the camera. The point of focus is rapidly changing and the camera must react in close to real time to keep the subject sharp. The X-T1 performed this task equal to a pro-level DSLR camera, even at its highest 8fps speed. Every image was in focus in the sequence of this runner coming at me. The only drawback to the continuous focus mode of the X-T1 is that at the 8fps continuous high mode it only uses the central 9 focus points. This can be very limiting, although for much wildlife and sports photography this is usually sufficient. 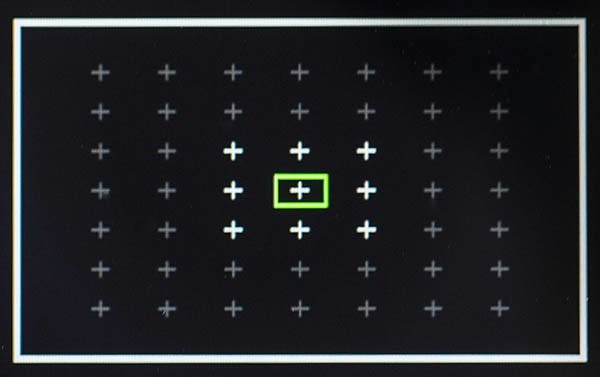 In continuous low mode of 3fps all focus points can be used. The WiFi feature on the X-T1 is the best I have ever used. In addition to allowing you to position the focus point, and take the photograph, you can control shutter speed, ISO, aperture, film simulation, white balance, macro mode, flash mode, and self-time from a smart phone or tablet using the Fujifilm Remote camera APP. You can access the WiFi feature from the camera with the touch of one button. 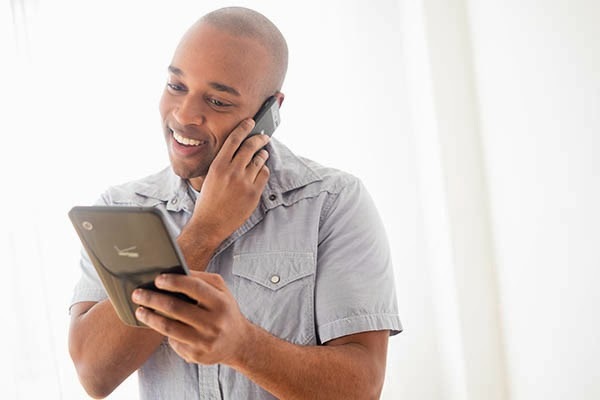 Images can be transferred from the camera to the phone to pass along to social media, emails, or whatever. This is one slick APP, easily the best I have ever used. Unlike many other I have tried and found finicky, this one actually works. I especially find this feature handy when I have to tuck a camera into an awkward location to take the picture. The X-T1 includes the same X-Trans CMOS II sensor with phase detection and EXR Processor II as the recently introduced X-E2. Enough ink has been spilled lauding its stellar image performance -- and deservedly so. Consequently, I decided instead to concentrate my tests on the mechanical performance of the camera from the point of view of a professional photographer. You can read my review of the X-E2 here. With all this in mind, I put the X-T1 to work. We had two lifestyle shoots planned for this week. Available light lifestyle shooting can be very demanding on a camera's responsiveness to a rapidly changing situation. It is probably similar to wedding photography in that the photographer is trying to capture a spontaneous, lively expression from the subject in a fluid, rapidly changing environment. 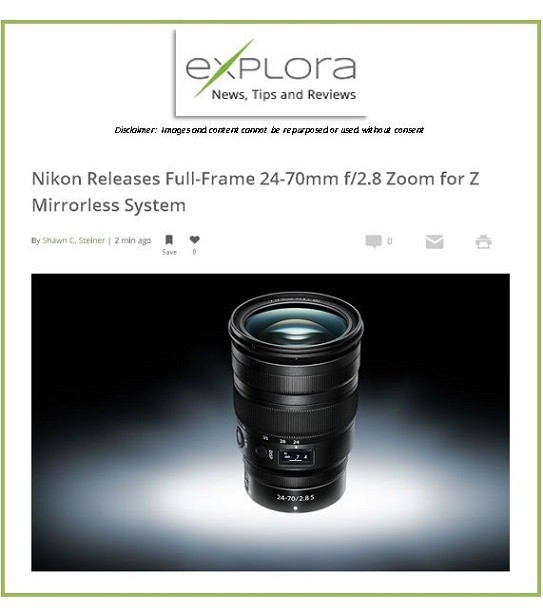 It relies heavily on the continuous focus feature. 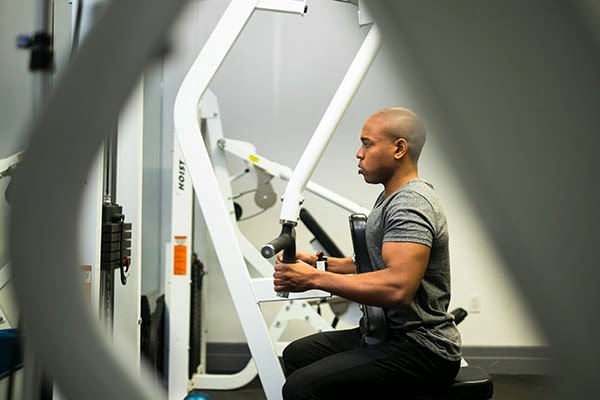 The photographer must be able to change focus points rapidly to anyplace within the frame and the camera needs to be able to track the point rapidly as the subject darts about. It is imperative in lifestyle photography that the face, and particularly the eyes, are sharp. This comparison set of images illustrates what the camera is up against. The dim scene on the left is exactly as it looks to my eye and through a viewfinder like my D4. You can see immediately that the model's face is completely in shadow and has very low contrast. On top of that, it is placed in the upper right corner of the frame out of reach for the focus points of the D4. Normally, I would have to switch to continuous S mode, grab focus, and move the camera to re-compose the shot. This is a very demanding situation in which to achieve accurate focus on the face, particularly if the subject continues to move. I know from experience in shooting in this location that even the D4 misses a lot of shots. On the right is how I want the scene to look when I open up the exposure to brighten it. A chief advantage of the X-T1 EVF finder is that the scene already looks like this brighter version. In this situation the model was constantly moving by repeating the action of lifting the canvas from the floor to the easel. The scene was strongly back lit, and the aperture wide open with the focus point placed on her eyes. In my lifestyle shoots I typically use available light, and, to put even more pressure on the camera, I mostly shoot back-lit with a very wide open aperture leaving little room for focusing error. A back lit situation leaves the models face in shadow with very low contrast, which is a very demanding condition for a camera to achieve focus. The stronger the back light source is, the tougher it is for the camera to focus. For me the Nikon D4 is the reigning champ of this kind of shooting, which is why I use it. This week I decided to shoot the X-T1 in tandem with the D4, not so much to compare one camera to the other, but to see if the X-T1 could approach a performance level that would make it a practical system to use for this type of shooting. The X-T1 delivered a large percentage of in-focus shots while shooting continuously on CL (about 3fps). A nice feature is that the camera can continue to operate at 3fps pretty much as long as you can hold the shutter release down. I found this rate of continuous shooting speed quite adequate for this type of lifestyle photography -- just fast enough to capture changing expressions and positions yet not so fast that you end up having to spend the rest of the week editing an excessive number of redundant images. To provide a candid look in lifestyle situations I keep the model constantly moving, while I grab shots on the fly. The movement could be anywhere from a few inches to a few feet, but it still requires rapid changes of focus in flat light, made all the more critical by the wide open lens apertures I use. A very strong light was coming in from the window behind the model but I chose not to use any front fill to preserve a more candid look to the shot. I instructed the model to keep turning around quickly and move about to create a more spontaneous look. Both the D4 and X-T1 missed a lot of shots due to focus in this difficult scene. In situations such as this where I know the camera is going to miss focus a lot, I intentionally over-shoot to bracket the focus. The two cameras ended up with an equal success rate of focused exposures. This is one of the few normally lit photos I took over the two days with the model's faces lit directly by a soft window light. I realize we all want a camera that is small, compact, and packed with pro-level features, but I feel camera manufactures may be taking this trend too far. For practical shooting, there is such a thing as too small. To my mind, the X-Pro1 hit the perfect balance of a small, comfortable size combined with practical use. A professional photographer is often responding to rapidly changing situations and needs to have controls available to accommodate this. They become impractical if they are too small or too hidden because of their diminutive size. 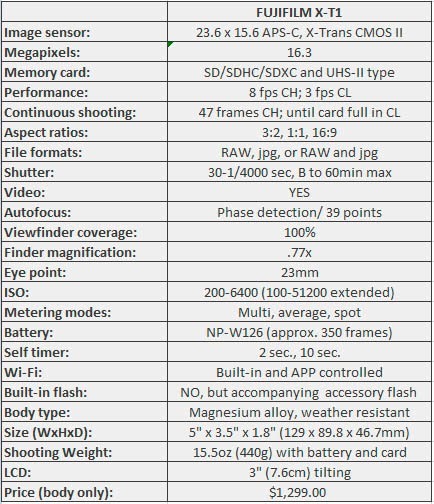 Perhaps the X-T1 would have benefited from being the larger size of the X-Pro1 instead of the X-E2. The controls, particularly the selector/function buttons, are a little too tiny to locate blindly while the eye is glued to the viewfinder. 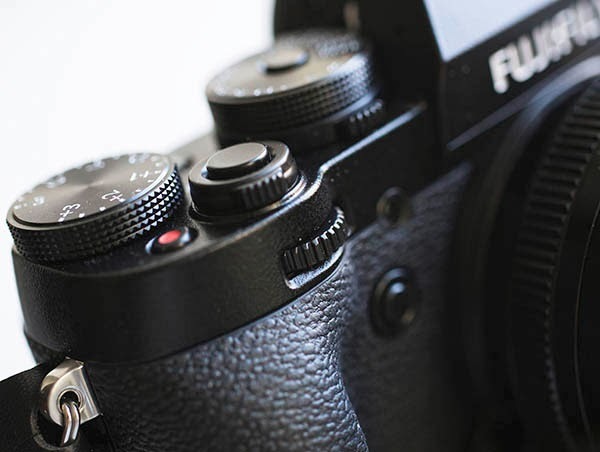 It is little wonder the X-T1 is winning design awards all over the place. Its new EVF finder is state-of-the-art, and the performance level of the camera raises the bar for mirrorless cameras in general. Auto-focus has been improved to best-of-breed and on par with many pro level DSLR's, while the new EVF is second to none in its ground-breaking improvements. The new layout and more retro-style of the camera controls is a big departure from prior X models. You are either going to like this change or not. Personally, I prefer it. For me it adds a more intuitive fluidity to their use. Once I became comfortable with the new layout, I found it enhanced the capability and speed of making changes on the fly. All photographs of the models were taken during two lifestyle shoots using the Fuji X-T1 and either the 35mm or 23mm lens. All the scenes were sets assembled in one of our daylight studios. 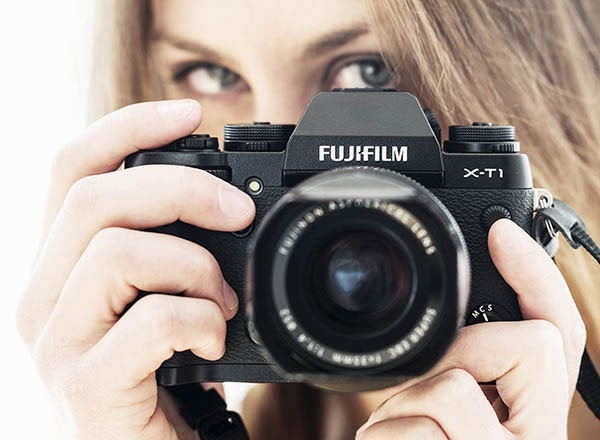 Fuji has come a long way in a short time from its earliest X model cameras. 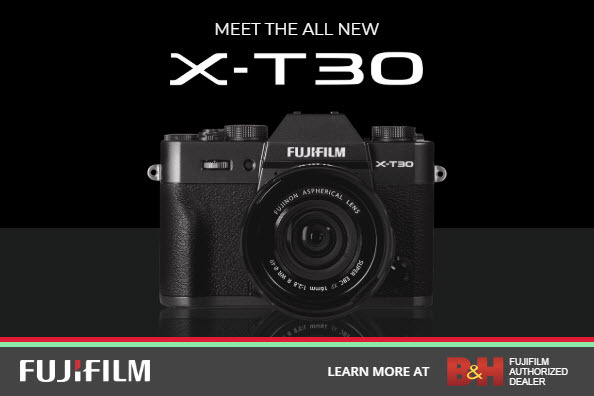 With the X-T1 model Fuji breaks new ground from the original X-Pro1/X100 rangefinder style. I can still remember the whir of the early camera auto-focus motors as they hunted for focus in dim lighting. 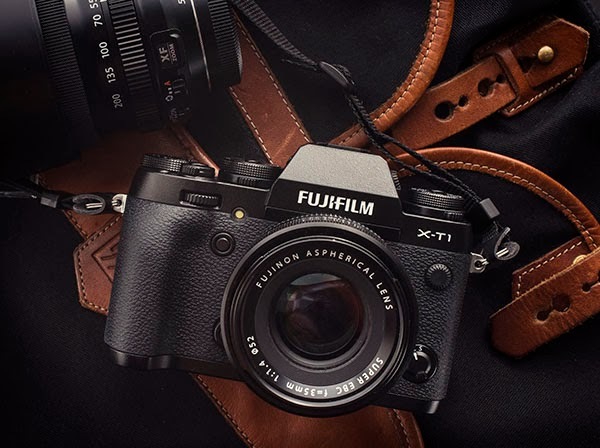 The company has made tremendous strides in improving this to the point where the X-T1 is now best of breed when it comes to dim light, low contrast auto focus shooting. One reason Fuji users are such loyal fans is that they know Fuji listens to the voices from the field, and makes mid-course adjustments to the firmware with a steady stream of improvements. On the first lifestyle day, I used the X-T1 sparingly as a secondary camera with the D4 doing the lion's share of the work. 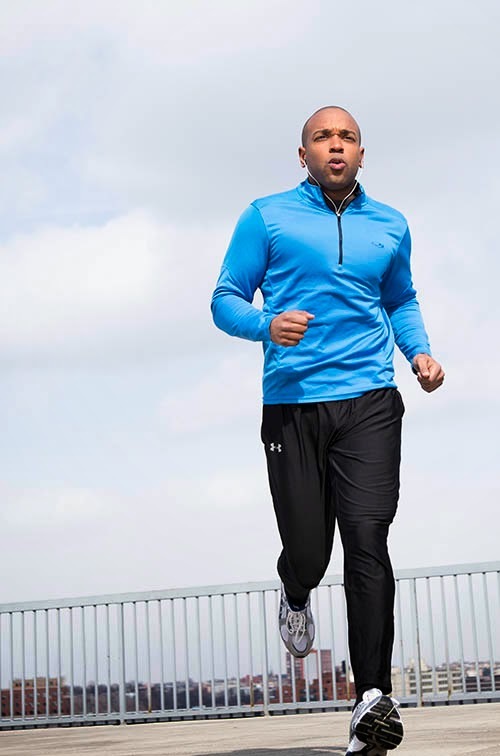 After viewing the results and performance, I went into the second lifestyle shoot day and used the X-T1 to do most of the shooting with the D4 in support role. The results from the X-T1 are impressive. I came away completely convinced I could use this camera alone for demanding professional shoots. Will it replace the D4 in my arsenal? No, but just putting the X-T1 in the same company as a D4 says a lot about what I think of its potential. It offers an alternative, dependable, fully capable system that is far less taxing to carry around. In a few weeks I will be doing a lifestyle shoot on a beach location and plan to have only the X-T1 with me. That says a lot about my confidence level in this camera's ability to deliver. Bottom line is I can stop my search for a compact alternative to a pro-level DSLR camera system. Fuji gift wrapped it for me with the X-T1. And then there are days when I feel this is the only camera I should ever really use. one of the best X-T1 reviews I have seen...but I have been told that this is the same sensor and processor as the X-E2...and I had issues with how the X-E2 handled skin tones...by smearing pixels...I got rid of my X-E2 for that reason...I know there are other professional photographers who had the same issue...has this gotten any better...or do you not see an issue here....this camera really interests me...just some things are a bit irksome. You're saying that when shooting RAW and processing a RAF file the smearing is still there?? Sorry, that is very inaccurate. There was an issue with the jpegs making skin look very soft, if you shoot raw its not an issue at all. I just did a test shot with my xe-2 and it seems to have been resolved. I would still shoot raw though. The smearing was a high ISO and on jpgs. If you are shooting portraits in high ISO and jpgs....yes...expect loss of detail. The issue isn't there with lower ISO's or with raw files. Nice write up. How would you compare it with the Df? I went through the following path: D40 -> FM -> F100 -> X100. I returned my Df after a couple of shoots and I'm looking forward to testing the X-T1 that I just got. I really wanted to keep the Df but I felt that I wouldn't use it as much as I wanted to especially with the X100 still around. I'm not convinced with the A7 bodies due to the lens selection. Excellent Review. I use the X-E1 whenever I don't wish to haul my D800 or D700 around. The X-T1 arrived yesterday but I've yet to open the box I've been so busy. I can't wait! These are lovely images BTW. Would love to see the beach scenes. Last year I took my D800 with the 70-200 and my X-E1 with the 18-55 to the beach, with my 3 YR old grandson… Need I say more? The 18-55 was grinding for a week! And I only took it out of my bag for about five or six shots realizing the sand was going to be an issue. I am looking forward to the water and dust resistant lenses coming later this summer to augment the X-T1. Fantastic review, thanks for taking the time to post it. I shoot low light and back lit subjects a lot so I think I will get on very well with the XT-1.